Sorry I have been MIA from this blog for such a long time! My family experienced a crisis that I hope no one ever has to go through themselves. It was something that I never thought could happen to us and I didn’t realize how often it occurs until it did. Hopefully this post gives you tips to prevent our mistakes as well information on what to do in case it ever does happen. On December 20, 2014, my husband and I took Seren and Starfox hiking on a new trail. We always had them both off leash because we never had a problem and they both LOVE hiking. When we were almost done and about to put them back on leash, a jogger came up from behind and startled Starfox. Normally he never has a problem with people, it’s Seren who’s the one who’s hesitant with strangers, but I guess because the trail was so narrow, he thought the guy was chasing him and freaked out. We chased after him but didn’t worry too much because we thought he would get to the end of the trail, let the guy go past and be waiting for us. That was not the case. He ended up sprinting all the way to the parking lot and then seemed to vanish into thin air. We were not even 2 minutes behind and ran into some mountain bikers that said they saw him and tried to call him over. They said that he then ran into an enclosed field. We followed and on the left side was a fenced off construction area and on the right was a forest that lead back towards the trail. At the end was a river, which we knew Starfox wouldn’t cross because he hates to get wet. But he was nowhere to be found. So we headed back and spent the next 9 hours hiking the ENTIRE trail in the dark searching for him. My brother and our friends came immediately to help in the search but we came up empty handed. We went back to the enclosed field area and my husband decided to climb into the construction area over the orange netted fence we originallly thought was too high for Starfox to jump. It led to a tunnel that went underneath the street. We found paw prints but just assumed he turned back around because it lead to a very steep drop and he would have been seriously injured if he fell from that height. 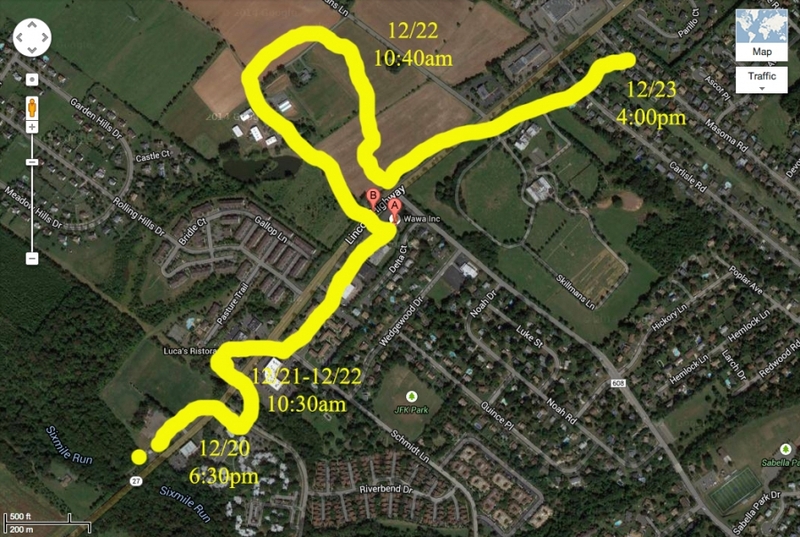 Another friend posted the news in a FaceBook group earlier and someone said they spotted him crossing the very busy street (Route 27) that was next to the parking lot hours before. So we all spent the next day searching in the apartment complex across the street and posting flyers everywhere. We looked until nightfall with no sign of him. The day after was a Monday, and we got multiple phone calls from multiple sightings. We were only about 15 minutes behind and when we spoke to the people that saw him, they said they tried to catch him but he sprinted away from them into Route 27 again. We searched the entire area but again he completely disappeared. At first we were happy to get the calls because we thought that he was out looking for food or water. But we later found out that he had been hiding underneath cars in an auto body shop pretty much right next to the trail! We had searched around that area previously but there was a part in the back that we did not notice before. Since the auto body shop was closed on Sunday he probably spent all day there, the day that we were across the street searching the apartment complexes. When the shop opened up again on Monday he was startled out of his hiding place, started barking at the owner, before he ran back and forth across the busy street and off to find his next hiding spot. Two days after his last sighting we received a phone call from a lady who lived about 2 miles away from the trail. She had called because saw the flyer at the movie theaters and said she saw him the day before in her backyard. So we went to the neighborhood to search for hours and were not successful. For the next three days we did not hear a word. At this point we were frustrated, exhausted and sick. We skipped Christmas, forgot to eat and drink, and we were out all day and night searching. My husband rode his bike and I took my car. We both walked in the cold and the rain at 2am posting more flyers. All that kept running through my mind was everything I wish we would have done differently in hindsight. If only we had him on the leash, if only we told the jogger to wait 2 seconds, if only we had searched the construction sight earlier, etc. I was sick to my stomach. I wanted to curl up into a ball and pretend that it wasn’t happening. One of our friends helped a lot to keep our spirits up and printed flyers for us and posted and searched when we needed to rest. Seren seemed to know we were in bad shape and just cuddled on the bed with us to cheer us up. Finally after the longest week of our lives we got THE phone call. I have never been so happy to receive a call from a number I didn’t recognize in my entire life! As it popped up on my screen I was thinking how fast I can get to the area he was spotted to follow his tracks and hoping he wouldn’t disappear again. Imagine my relief when Linda (the greatest woman in the universe!) Said that he was safe and sound, laying on her couch! She said she saw him wondering in her neighborhood (about a mile away from the neighborhood he was last seen in) and she just opened the door and he just walked right in! I cried tears of joy and told her that I would get there asap. When I was finally reunited with Starfox, he was skinny, but very happy and I think relieved to see me. His mouth was crooked, but everything else seemed ok. We took him to the vet and found that his mouth was fractured and he was stuck with a cement mouth and cone for 6 weeks, but at least he was alive! 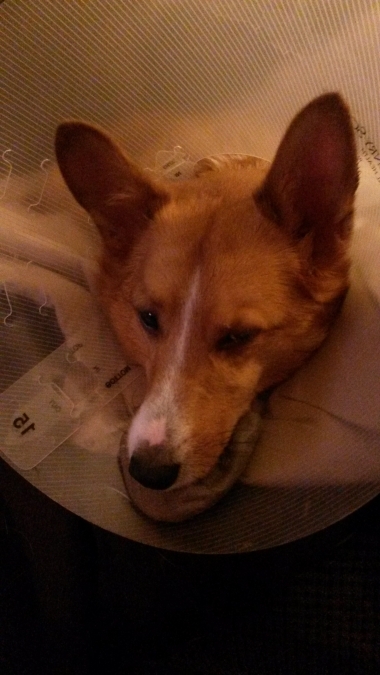 Starfox miserable with his cement mouth and cone. Our story had a happy ending but it was also a wake up call. It took awhile to recover from the stress and return back to normal, but at least we were able to return back to normal. We were able to celebrate New Year’s and have a welcome home party for Starfox. But there are so many stories that do not end happily. Every time it is brutally cold outside I can’t help but think what pets are out there cold, scared and alone. I can’t even imagine the torture that families have to go through never knowing what happened to their furry family member. Please have your pet microchipped and have tags with your address and phone number on the collar. Although they will do no good until your pet is actually caught. Starfox did have tags but it didn’t help when he was running away from people trying to catch him. So we are also looking into GPS options. We ordered a product called TrackR and will let you know how it works once we receive it in the mail. Here are some steps to take in case this ever happens to you. Step 1. Look within a 2 mile radius at first and then branch off from there. Leave out pieces of your clothing or their favorite toy and some water to keep them in the area. Dogs tend to linger where they last saw their owner. Starfox ended up staying about 5 minutes away from the trail until he was frightened out of his hiding place. Step 2. Call your local police and animal control as well as surrounding towns. Each town handles animal control separately and they DO NOT communicate with each other. And no there isn’t like a statewide database, where if you report your dog missing in one town, every shelter or animal control officer in the state will be notified, although there SHOULD be! Step 3. Post on Facebook Groups like Lost Dogs New Jersey or Lost and Found Pets New Jersey. There are wonderful people on there that are always on the look out and have great tips and even have flyer templates that you can print out. Step 4. Go to surrounding animal shelters in person every day. There could be a mix up in the description of your pet and they only hold a pet for 7 days (I’ve heard stories of less than 1 day!) before they either put them up for adoption or euthanize them if they are a kill shelter. Step 5. Print out flyers and post them EVERYWHERE. Especially places with high traffic like Wawa. Laminate your flyers to prevent damage from the rain and print BIG. Also tell people NOT TO CHASE your pet but to call your number right away. Also take any leads that you get with a grain of salt. One lead took us 12 miles away and turned out to be false. If it wasn’t for that set back we probably would have been in the area when Starfox was spotted. Step 6. Take BREAKS! We did not do this initially and became sick and burnt out very quickly. Step 7. Don’t lose hope and ask and/or accept help. Hard advice to follow when you are going through it, because I lost hope about every hour. My husband, friends and even Seren helped me through it. My husband and I normally don’t like to ask anyone for help because we hate to burden or inconvenience others. But we knew we couldn’t do this alone and in our case we were lucky that many of our friends offered to be part of the search team. Step 8. 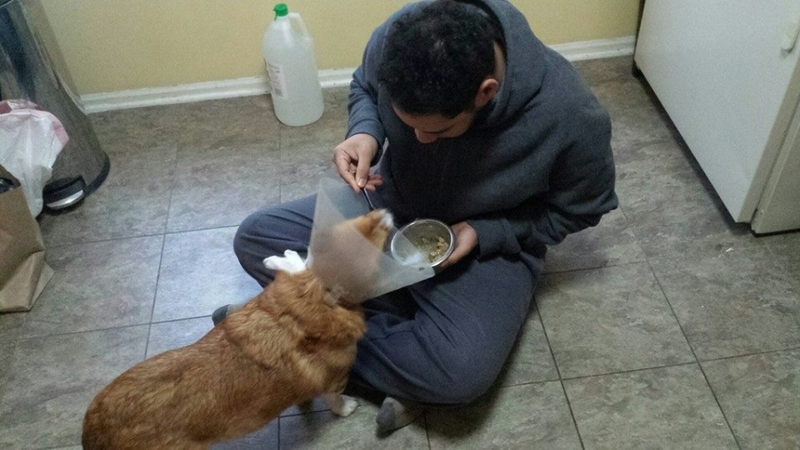 If you do find your pet and he or she is injured, bring them to an emergency vet place like AnimERge as a lot of standard vet places do not do certain types of surgery. We took Starfox to 2 local vets that couldn’t perform the surgery before we eventually took him to AnimERge and they were great. 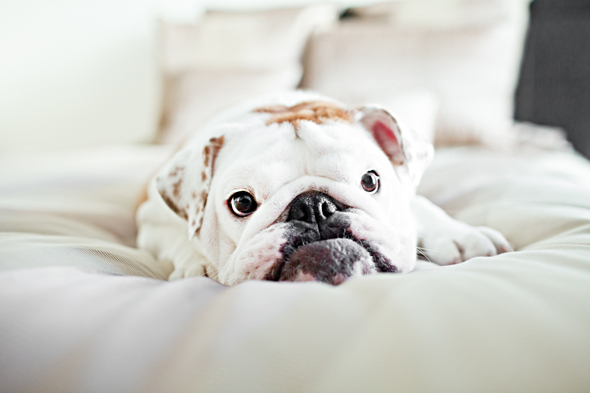 Even if your pet seems fine, bring them to your vet for a check up. Step 9. Call animal shelters to let them know your pet has been found so they can take it off their list. Also, take down all the signs that you posted. Although most businesses do this after a few days any way. A few had the courtesy to call before they took them down, mostly the local mom and pop shops. Step 10. If you happen to see a lost pet, DO NOT CHASE it and call your local police right away. Also post on the FaceBook groups mentioned above their description or if you have a photo even better! This was a humbling experience and it taught me that there are really great people out there and how amazing our friends really are. It also taught me to slow down, cherish what you have and live in the present moment. You don’t truly know what you have until it is gone. So whether it be your health, family and friends, or just your life in general, be grateful for each and every moment you are alive!